This is a new type of article from me. There are minis out there that might be called iconic, impressive, classic or interesting and I want to explore a few of these, their looks, their history, their rules and their fluff. If you like this sort of thing, let me know in the comments section below, and I’ll try to churn out a few more. For every tank that the Space Marines use when they embark unto the cauldron war, from the mighty Land Raider to the humble Rhino, for myself and many others, the king of the hill is still the Predator. Whether you want it for assassinating characters, pounding heavy infantry or ripping armour to shreds, this versatile tank has some solid rules and it looks like a boss too. 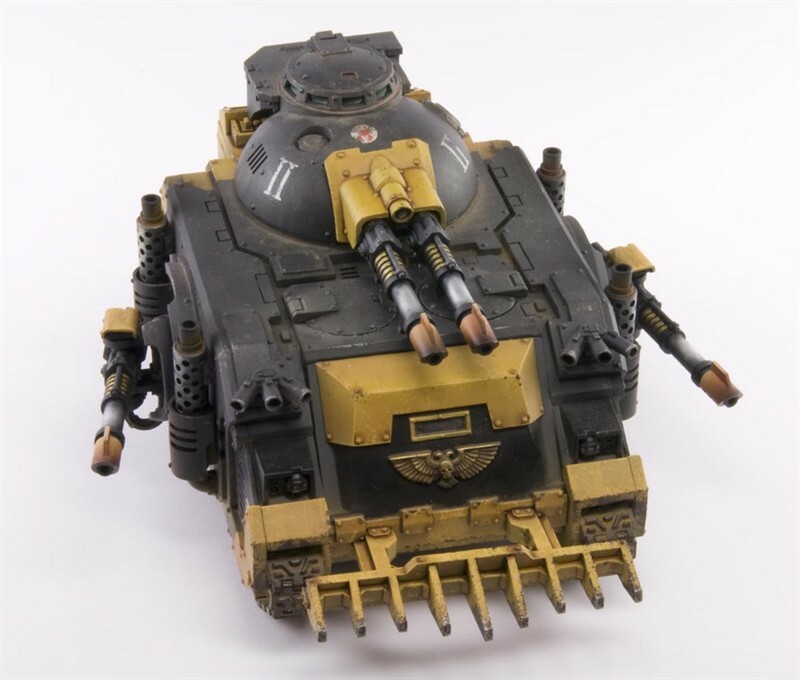 Let’s take a closer look at my favourite Space Marine Tank. 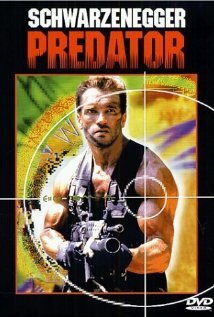 In 1987, the word ‘Predator’ got a new lease of life when Arnold Schwarzenegger, Jesse Ventura, and others tried to kill an alien in a Central American jungle. It’s not a nice word when you actually think about its connotations outside of the animal kingdom, but with that film, it gained a certain coolness. 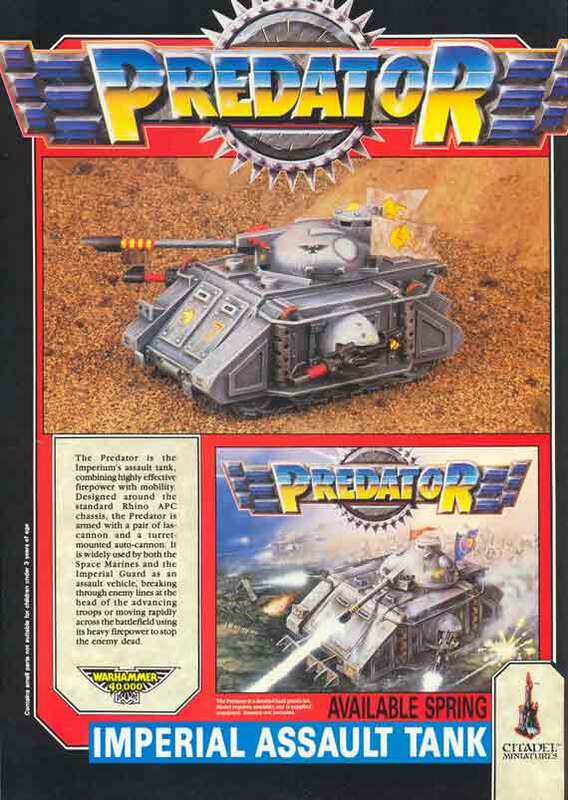 Two years later, still very much in the Rogue Trader days of Warhammer 40,000, the Predator battle tank rolled heavily onto our table tops and began blasting its way into our hearts. Not that I’m suggesting any link between the film and the tank but I’m totally suggesting a link between the film and the tank. 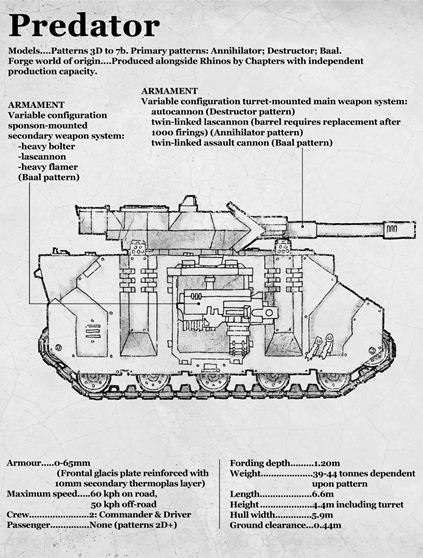 Aside from the homemade tanks (reminds me – must buy shampoo), the Space Marines had been relying on transports and APCs up until this release, and this tank became the first bit of armour dedicated to shooting. A moving artillery base, it offered a combo of lascannons and an autocannon to smash through ork wartrukks and the like. As an ‘Imperial Assault Tank’ it was also available to the Imperial Guard and (knowing Rogue Trader) probably all other factions as well, but it was built on the Rhino STC and that made it Space Marine through and through. 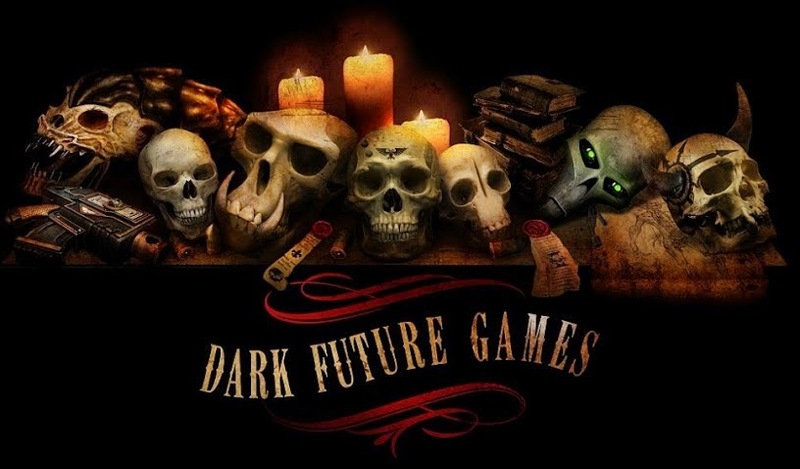 Over the years, the Predator lost a little glamour and gained a bit more grimdarkness as 40k began developing its own identity. It dropped the rounded turrets and sponsons in favour of blocky, more utilitarian designs that matched up far better with other SpaceMarine releases. In recent years, Forge World have developed the Deimos Pattern Predator, meaning the nostalgic amongst us get to work with something very similar to the original tanks (though of a much higher quality). There were also a couple of variants introduced over the years. The Predator Annihilator showed up somewhere in 2nd Edition bringing with it the lascannon turret that’s now included in the standard box. 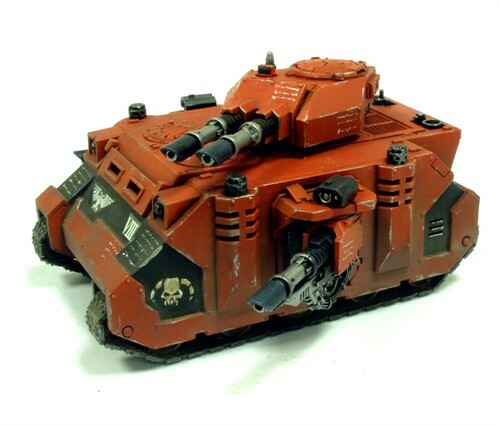 A specific Chaos Predator was released too and the Blood Angels got their own ‘Baal Pattern’ Predator sporting anti-infantry weaponry in the form of assault cannons and flamers. Forge World also put out the slightly sleeker MKIVC variant too. 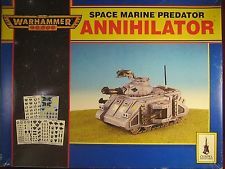 And while Razorbacks, Whirlwinds, Vindicators, Hunters and Stalkers have joined the ranks of the Space Marine vehicles, along with the Land Raider and Rhino, the Predator has remained a stalwart of the armoury, and a great addition to most forces. 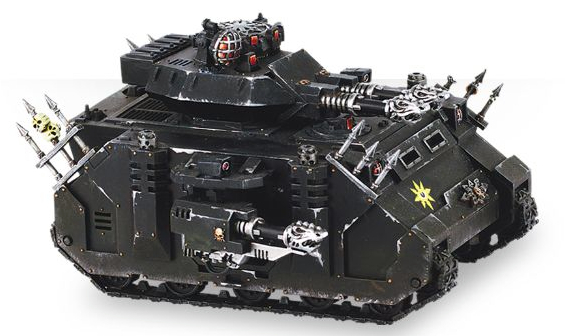 The first Predator tanks were created to deal with one particular problem – Orks. As humanity expanded across the stars during the Dark Age of Technology, their early encounters with the Orks meant that humans had to rethink their battle tactics and so the Predator Destructor (that’s the heavy bolter/autocannon version) was born to help mow down Orks at long range. 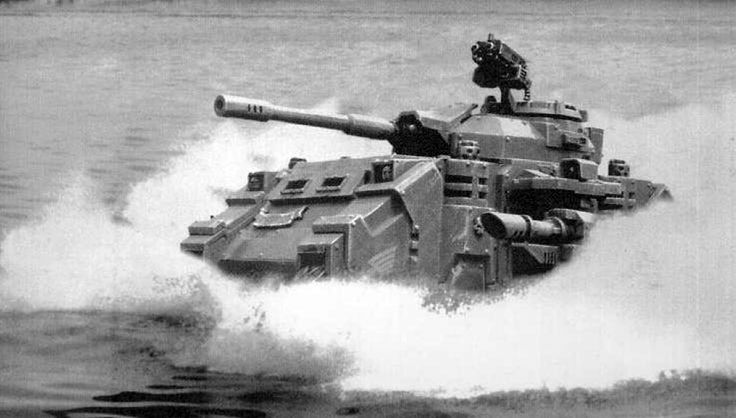 Originally, these tanks could carry a small amount of troops too, but when this role was taken over by the Razorback, it allowed the Predator to hold more ammunition and increase the firepower of its weaponry. 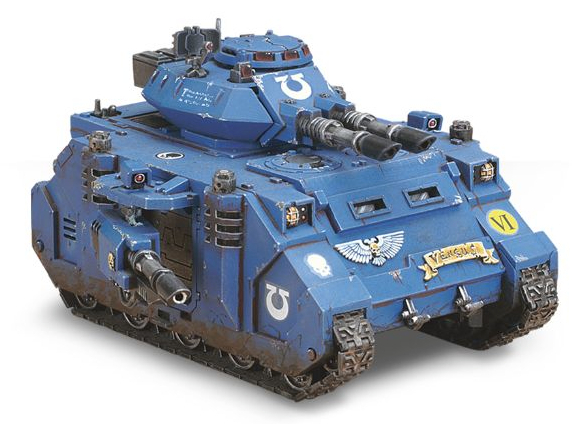 During the Great Crusade, the Imperial Army also employed the tank but when the Imperial Guard was born, Predators became Astartes-only vehicles. A number of variants have been born out of necessity. 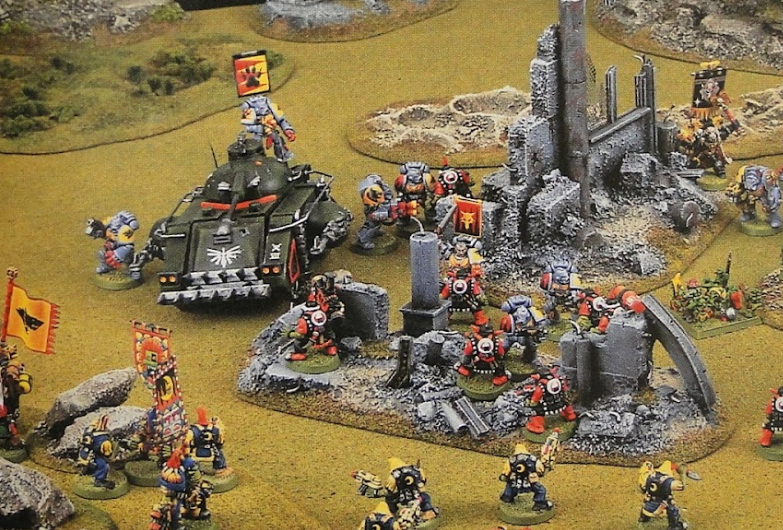 Relics like the Infernus and Executioner are very rare in the 41st Millennium, while the Blood Angels and their successors jealously guard the STCs for the Baal Pattern (much to the annoyance of Mars). But due to their high output of firepower and their all-round usefulness, Destructors and Annihilators remain the favoured fire support tanks of the Space Marines. Because back then it was totally normal to have a Dark Angels Predator supporting the Space Wolves, ok! Leaving the CSM and Baal Patterns aside (though this does count towards the CSM one as well), you have two distinct choices with what comes in the typical Space Marine Predator box. All you have to ask yourself is what role you want it to fill – anti-tank or anti-infantry (you can try and mix it up more but this is essentially futile). Decide what your army is already well equipped to deal with, and fit your Predator with the other. The Autocannon/Heavy Bolter option means you can hunt infantry (including more elite units) with a very good chance of smashing it off the table. All Lascannons mean you’ve got a good chance of blasting other tanks into ceramite dust. What’s more, it’s relatively cheap points wise and being a tank, it’s got a good bit of speed going for it too. Also to its advantage is an additional AV point on its front armour compared to most Rhino chassis vehicles making it a lot tougher to pop for all but the biggest guns. Add a missile launcher and/or storm bolter for a very low cost and weapon destroyed results might not be nearly as bad as they could be either. What’s more, the Annihilator weapon load out, at a pinch, could be used as a last gasp anti-air option (though this would be a bit of a waste in most cases) as you get three lascannon shots, one of which you can re-roll thanks to it being twin-linked. AA may not be its designated role, but I’ve used it a couple of times to this end (out of desperation) and managed to bring down a Nightschythe once (lucky rolling and said desperation can be a glorious thing sometimes). Touched on above, one the best things about the predator is that it looks like an actual tank. Despite its bulky chassis, the lines even on the current turret, somehow make it look a little sleeker. In fact, it definitely has the look of a hunting beast about it. This is outlined further when you’re playing a game and you see those three nasty looking lascannons peeking out from around the corner of a building or some ruins. Though it gets nuked pretty early on, one of its rare appearances on screen outside of gameplay footage is this video from the opening of the first Dawn of War video game and I still really enjoy watching its lasers lance out towards the Ork lines (until half a bridge gets dropped on it). I just really like the fact that it looks like a tank that looks at all other tanks and says “Oh, you have just one big gun? Maybe two? Aw. That’s sweet.” Even if there are more effective vehicles out there (and there are) the Predator looks the part in any of its patterns, and for what it does do, few if any do it better. The Predator is awesome. Errrr… yeah, that’s about it. There doesn’t need to be a conclusion really. This wasn’t supposed to be ground-breaking or even particularly enlightening. I just wanted to wax lyrical about one of my favourite miniatures. I can’t say what I’ll look at next, but I had a lot of fun writing all of this so I’ll write another article like this soon. ← Two New Tyranids – the shape of releases to come for 40k? A cool idea – more little expostions please. I never used predators, I tend use devastators in that role with my loyalists (and vindicators for my traitors). But now I’m tempted to add one and discover a little predator magic for myself. D.
Fabulous post. You said “[i]f you like this sort of thing, let me know in the comments section below.” Well, I like this sort of thing. More please! Also, “homemade tanks (reminds me – must buy shampoo)” reminds me – must buy deodorant. My favorite Predator build is still the original. Autocannon plus Lascannon. It can’t take on truly heavy Armour as well as the Annihilator, but it does an excellent job on light-medium Armour thanks to the extra shot, it comes in significantly cheaper, and the extra shot also makes it a bit more useful when you’re just faced with Infantry across the board.